How do you get Mythic Cats? 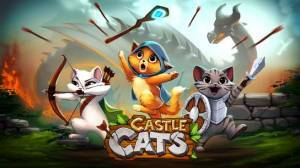 Castle Cats is is a free-to-play RPG where the goal is to collect cats and send them on quests to complete the storyline which involves building a fortress, evolving cats, and fighting an evil Pugomancer. The game mixes clicker mechanics with time management and card collecting. The game itself is pretty straight forward, players form a party of cats and assign them to timer-based missions based on each cats special skills. Regardless if the cat was earned through an in-app purchase or randomly found in a treasure box it will begin as a kitten and from there with the help of different embers it can be evolved. For players that are impatient and want to progress faster there is a game mechanic which is basically just tapping the screen that allows you to speed up the battles your cat engages in. Once the limited tap energy runs out you will have no option but to wait. Step 1: Recruit cats to your guild. Step 2: Send the cats off on timed quests. Step 3: Either relax and let your cats do all the work, or help them out. The quests usually only take several minutes to complete so you will need to log on often to be able to start new ones and continue the flow of collecting resources. Entering battles and defeating the enemies will finish the quests quicker. Tap the enemy to damage them and tap on a cats portrait to use their attack skill when it is ready. Get into the habit of completing the daily quests, they are the same each day and its an easy way to earn coins and get a free box with a cat inside which you can add to your guild. Coins is the only way you can get a new cat. Focus on saving up enough coins for the expensive boxes as these will contain rare cats which are better for missions. A good strategy is to start by levelling up your starting cats as high as you can so you have one strong cat for each category. Once you have done this you can begin working in your newer cats into the secondary quests in order to level them up also. There is no need to have two cats that have identical skills. It is more beneficial if all your cats possessed unique skills so you always have the perfect cat for the different quests. Even if you don't play just by entering the game each day will make you eligible for daily prizes which can include cats and gems. Check out our 'How do you get Mythic Cats?' page to find out what mythic cats are and how to get them.